VANCOUVER, BC – (November 27, 2017) – Kenadyr Mining (Holdings) Corp. (TSX-V: KEN) (the “Corporation” or “Kenadyr”) is pleased to announce that it has entered into option agreements (the “Option Agreements”) with Realgold Resources Corp. (the “Optionor”) for the acquisition of 9 mineral exploration licenses (the “Licenses”) covering approximately 1,200 square kilometers of the most prospective gold ground within the Middle Tien Shan carbonaceous shale belt of the Kyrgyz Republic. The licenses cover most of the highly prospective rocks (Riphean carbonaceous shales) and occur within a strike length of 800 km from west to east. These licenses contain approximately 80% of the exposed Upper Proterozoic black shales found in Kyrgyz Republic, that are not within a protected area (i.e. National Park). Option Agreements to conduct exploration activities on the Licenses and to maintain the Licenses in good standing under Kenadyr’s oversight. Kenadyr is an officer of a material subsidiary of Realgold and accordingly has abstained from voting in connection with the approval of the Option Agreements by the Kenadyr Board of Directors. Kevin Ma, the CFO of Kenadyr, is also the CFO of Realgold. The transactions contemplated by the Option Agreements are subject to the approval of the TSX Venture Exchange. Kenadyr is in possession of a complete data set, compiled during the Soviet era, for all license areas. This dataset includes all data from thorough regional, with follow up local, exploration programs. The dataset includes all geological and geochemical maps, maps of soil sediment geochemistry, stream sediment and pan concentrate geochemistry, airborne and ground geophysical surveys, compiled geologic reports and maps of all rock chip and channel sample locations and results as well as all known mineral occurrences. Dr. Anatoly Gibsher, from the Novosibirsk Institute of Geology and Geophysics, and a well-known expert on gold deposits within the Asian and Siberian Upper Proterozoic carbonaceous shale formations, was the leader of the geological reconnaissance team. He stated: “The geological setting is very similar to that at Kumtor. Within the licenses, and extending for many tens of kilometers are intensively altered and pyritized carbonaceous shales which belong to the same formation that hosts the Kumtor deposit”. Area west of Kumtor – The Akbelsuu License covers all the outcropping favorable black shale units to the west of Kumtor. The area has seen very little exploration work. North western (Chaarat) Areas – In the north west of Kyrgyzstan, Kenadyr has acquired the option to the licenses surrounding both the Chaarat gold deposit and the Kuru-Tegerek gold deposit (operated by China Gold). The licenses also cover the outcropping carbonaceous shales which occur on strike to the east of the Chaarat Gold deposit. 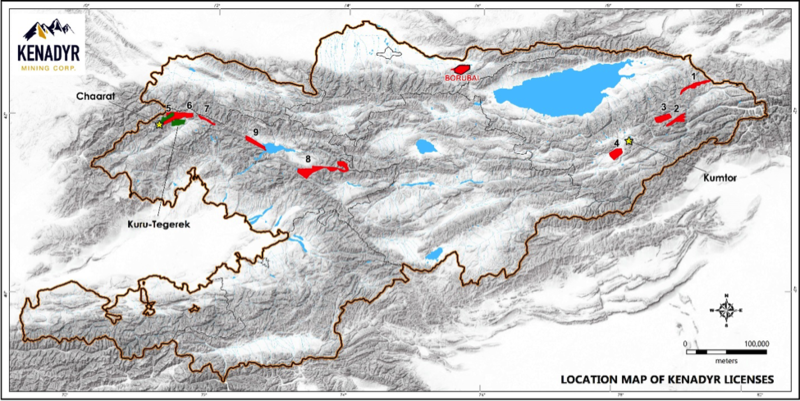 Central Kyrgyz licenses: Ustasai and Kokirim-Bardambot – The Ustasai license covers a large pull-apart (rotated and extended) segment of the Talas Fergana Fault, arguably the dominant structural feature of Tien Shan Mountains, with a dextral strike-slip fault displacement of 240km. In this pull-apart segment covered by the license, the rocks are intensely altered and bleached with alteration thicknesses of more than 500m. A strong airborne potassium anomalies occurs over the alteration zone. The Kokirim-Bardambot license – The license covers an area of 342 sq.km of highly prospective ground where carbonaceous shales outcrop in multiple erosion windows. The rocks in the erosion windows are highly altered and pyritized yet they were never assayed for gold during the Soviet expeditions. Kenadyr Mining is focused on creating shareholder value, both through project acquisition and exploration towards resource definition, within the Kyrgyz Republic. Kenadyr achieves a balance of risk with a blended portfolio. The company owns the Borubai Project which hosts both the South Zone and East Zone (currently being drilled). Previous drilling included hole EZ-1-17 (50 meters at 8.15 g/t Au) from the East Zone and 40m @ 6.17 g/t Au in drill hole SZ-1-17, from the South Zone (see Kenadyr’s news release dated November 14, 2017). These Zones are directly adjacent to the TBL Mine operated by Zijin. Complementing this, the company holds an unrivaled ground position covering the bulk of the prospective Black Shale Hosted Gold ground in the Kyrgyz Republic. On behalf of the Kenadyr Mining (Holdings) Corp. This news release contains forward-looking statements relating to the future operations of the Company and other statements that are not historical facts. Forward-looking statements are often identified by terms such as “will”, “may”, “should”, “anticipate”, “expects” and similar expressions. All statements other than statements of historical fact, included in this release, including, without limitation, statements regarding the future plans and objectives of the Company are forward-looking statements that involve risks and uncertainties. There can be no assurance that such statements will prove to be accurate and actual results and future events could differ materially from those anticipated in such statements. Important factors that could cause actual results to differ materially from the Company’s expectations include the success for failure of the Company’s proposed exploration activities on the Bourabi Project or its resource potential relative to the TBL Mine and other risks detailed from time to time in the filings made by the Company with securities regulations.